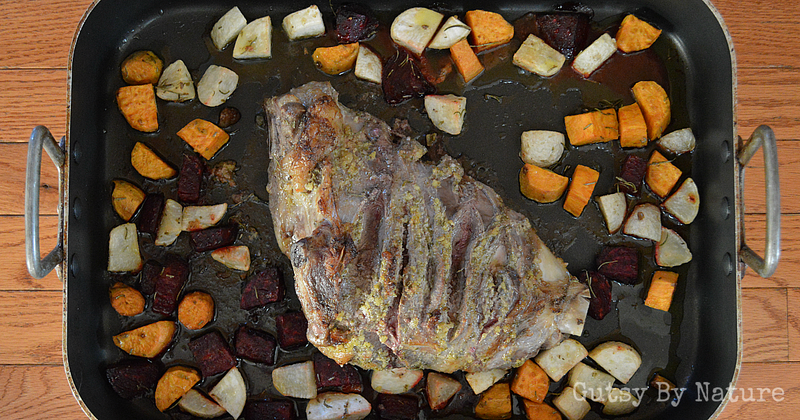 If lamb isn’t your favorite protein, this recipe for roast leg of lamb could convert you! Lemon, rosemary, and garlic provide maximum flavor for both the meat and for your choice of assorted root vegetables that roast alongside the meat, providing a nutrient-dense meal that would be perfect for a special occasion. Thanks to the fact that lamb is best roasted to a medium-rare temperature, you could even make this on a busy weeknight. And, if you aren’t serving a huge crowd, you’ll have leftovers for at least a couple more meals (a perfect excuse to make comforting shepherd’s pie, right?). Why make lamb part of your diet? I have mentioned before that I didn’t grow up eating lamb, but have come to really love it in recent years as I have been striving to expand the diversity of the proteins that I consume. If you have or suspect you have food sensitivities, it is important that you don’t restrict yourself to a small number of foods. When you eat a highly restrictive diet, even one that is only comprised of nourishing choices, you could end up developing new food sensitivities, or what scientists who study this phenomenon refer to “loss of oral tolerance.” That is a scary sounding phrase, but it simply means that your body is becoming less able to determine the difference between food that it should accept and dangerous invaders it should try to attack. There are other contributing factors (this article from respected doctor, Datis Kharrazian provides a good introduction to them) to a loss of oral tolerance and it is important for anyone who is experiencing this phenomenon to be aware of these. Restrictive diets and healing protocols like AIP or SCD do not cause loss of oral tolerance, but we sometimes see it happening to people who are on these protocols – especially if they don’t eat a wide variety of foods, and simply “dieting harder” will not make things better. For the Paleo autoimmune protocol (AIP) elimination phase, choose root vegetables that are not nightshades. Not sure what a nightshade is? Don’t be confused by inaccurate lists. This is the definitive, correct list. Good options are carrots, sweet potatoes, beets, parsnips, celery root, turnips, rutabagas, and celery root. For the Specific Carbohydrate Diet (SCD), choose root vegetables from the official legal list. Good options are rutabagas, celery root, beets, and carrots. For low-FODMAPs, omit garlic from the marinade and choose root vegetables that are low FODMAP as tested by the leader in this area, Monash University. Good options are carrots, potatoes, parsnips, rutabagas, turnips, and celery root. Combining protocols? Carrots, celery root, and rutabagas work for all three! 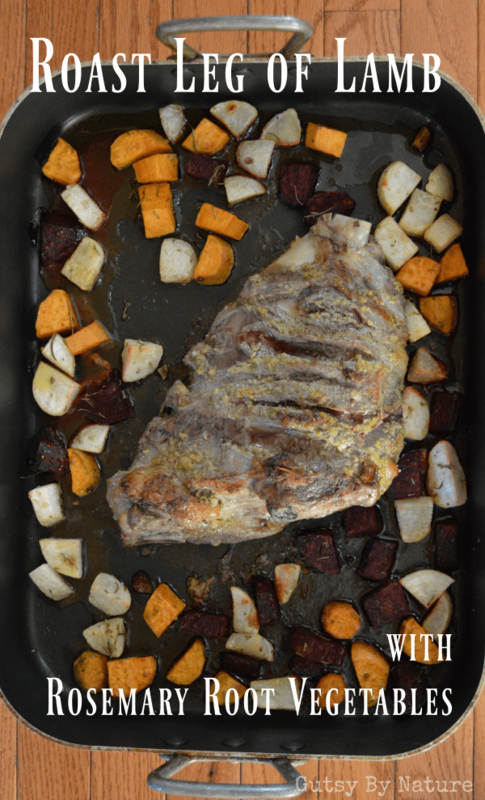 If lamb isn't your favorite protein, this recipe for roast leg of lamb could convert you! Lemon, rosemary, and garlic provide maximum flavor for both the meat and for your choice of assorted root vegetables that roast alongside the meat, providing a nutrient-dense meal that would be perfect for a special occasion. In a small food processor, puree garlic, salt, lemon zest, and 3 tablespoons rosemary. Add lemon juice and 3 tablespoons olive oil and pulse to make a smooth paste. Make shallow cuts in meat about ½ inch apart. Rub paste all over meat, taking extra care to get it deeply into the cuts you made in the meat. Place in a shallow baking dish and cover. Marinate in refrigerator for up to 24 hours if possible. Remove from refrigerator 2 hours before you plan to start cooking. Place lamb in large roasting pan and place in oven to roast for 15 minutes. Meanwhile, peel and cut vegetables into 2-3 inch chunks as necessary. Toss with 1 tablespoon oil and 1 tablespoon fresh rosemary leaves. Sprinkle with salt as desired. Remove lamb from oven and scatter vegetables in pan around it. Reduce oven temperature to 350 degrees F and roast for 40 minutes, or until temperature gets to 120-125 degrees F (medium rare). Remove from oven and roast rest for 20 minutes, then carve and serve. The “loss of oral tolerance” is honestly something I hadn’t heard of before. It makes perfect sense! With that concept in mind I will definitely make some adjustments to my eating habits. Thank you so much for taking time to highlight this concept through this article. Thanks Jaime!